∙ Need Extra Longer Screw? Highly Recommend Items arrived well packed. Accessories quite basic. Should be easy to install. Items arrived well packed. Accessories quite basic. Should be easy to install. Will try to install this weekend. Great received Toilet bidet seat in good condition and safe packaging it comes with all accessories no need to buy anything else and great service from seller 😆😆😆😆 good buy. Very satisfied with product. Followed the steps per the webpage and installation was a Breeze. Highly recommended. Item works as advertised. Thanks. Good quality. Easy to install. Work well and good water pressure. Would recommend to buy. 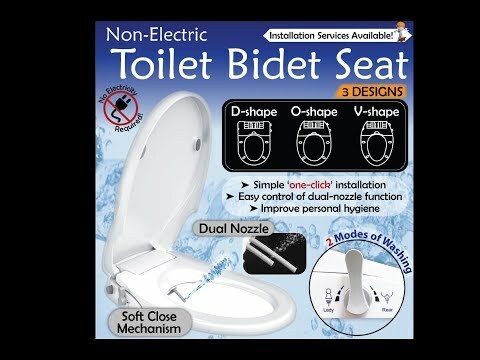 Will buy another set if other toilet seat needs to be replaced. Received in good packing but yet to try, thank you seller! Very fast delivery within 2 days. My second order and great for all home users. Purchased on 5th Apr, received the next morning. Super fast delivery. Has WhatsApp seller on shape and some question. Was impressed by seller customer service and fast response. Thank you seller. Hi, i would like to know what shape is this please so that I can order the spray seat cover. Thank you. Hello, does the item come with the accessories such as 3 point adapter and L shape flexible hose?